Patterning itself after the glory of Rome's Kindred society and the ages of kings that followed, the Invictus stands as a model covenant, one immune to the passage of time. But how well do ancient ways mesh with the Damned of the modern world? On whose backs is the Ivory Tower's foundation built? Details the history, hierarchy, and goals of the Invictus (one of Vampire's core factions), and serves as an invaluable guide to the world of the Kindred from the covenant's unique viewpoint. 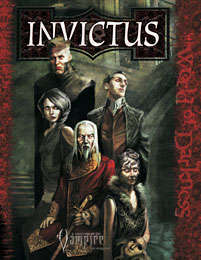 Features new bloodlines and powers unique to the Invictus, making the book a sure draw to the players. Provides settings, antagonists, and story seeds for Storytellers. Invaluable for running political and intrigue chronicles, as the Invictus is the covenant of Princes and power-schemers.